My love affair with Vera Wang Cosmetics continues. I've already featured a couple of items from the gorgeous collection Vera Wang introduced at Kohl's. Today, I continue my series - and gush some more. Available in seven shades, Vera Wang's Smoothing Lipcolour ($18.50) adds the finishing touch to our overall look, providing rich, long-wearing, stay-true color and moisture to the lips. The medium-coverage, lightweight formula offers spectacular color in three gorgeous finishes: cream, shimmer, and sparkle. These lip colors glide on effortlessly, feeling silky-smooth and providing extraordinary shine to leave lips looking soft and glossy. The shades stay true and wear evenly, lasting up to eight hours (not on me, but no lip color lasts that long on me). The moisture-rich formula softens my lips nicely. Conditioners and moisturizers help smooth the lips, not only for eased application, but also for the reduction of fine lines. Antioxidants, lipid barriers, and vitamin E help protect the lips from environmental damage, while a blend of shea butter and soybean ester help condition and moisturize. 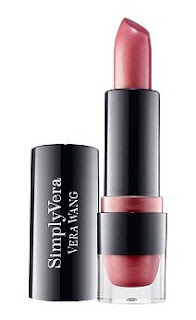 The descriptions of Vera Wang's Cosmetics on the Kohl's Web site are spare - but the photos are fabulous. Go there, click on a little swatch color that interests you, and the large photo of the product will change to your selected color. I love that. The three shades I've been trying, courtesy of Vera Wang, are, from left to right above, #707, #710, and #712. After wearing these, I want the other four! I can be greedy. Here are some swatch photos to demonstrate how gorgeous these colors are. My swatch photos were taken in full sun, with #707 at the top of my arm, #710 in the middle, and #712 at the bottom. These shades run from light and pastel to rich and racy. Shade #701 is a very warm rose. In person, it has a touch of coral in it. It's an amazing shade - one I can wear, even with my preferences for cool tones. Shade #710 is a shimmering pink that actually works, despite the fact that it's lighter than my lips. Instead of looking like a 70's throwback, as I often do in light, shimmery (some would say frosty) mauve pink lip colors, I look (in my humble opinion) pretty darn good in it. I'm wearing it as I write, and my lips feel fabulous. Shade #712 is a "me shade," a mauve-toned rose that's simply divine. I am enormously impressed with these lipsticks. If you've been reading, you know that I'm stunned by the whole Vera Wang Cosmetics line. Get thee to a Kohl's! I plan to order numbers 702, 708, and 711 online. I adore the three shades Vera Wang sent me, and I am willing to put my money into this line big time. I am blown away by it, and I'm ready to say it's the best mass market line I've ever tried. I still have more to show you. The Illuminating Concealer is totally amazing. Where can you find Vera Wang Cosmetics? Only at Kohl's.